The Samsung Galaxy S II Plus is an updated version of the groundbreaking Galaxy S II smartphone that is, like its predecessor, available in NFC and non-NFC versions. 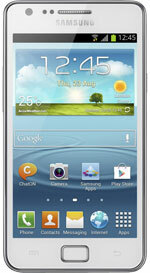 The Galaxy S II Plus runs Android 4.1.2 Jelly Bean and includes a 1.2GHz dual core processor, 4.3-inch 480×800 screen and 8MP camera. The S II Plus was announced on 10 January 2013.